Sending to a lot of mailers means a LOT of tedious work. All that logging in, and all that copy and pasting make for a long day when you're trying to build your business. "I thought the way I was sending mailings before was efficient, until I learned about Ullti-Send. This is a MUST have, I'm hooked and never going back!" "Ulti-Send is for mailing, what roboform is for passwords. 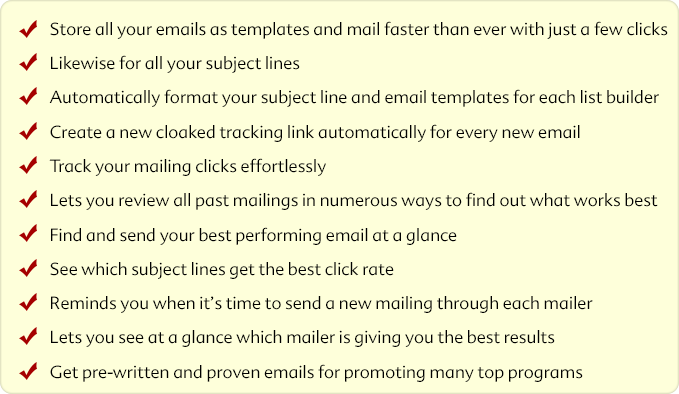 I do a lot of mailing and this really saves me a ton of time. No more copying and pasting...EVER"
Unlike “old school” automation systems, Ulti-Send won’t have you missing out on important member’s area updates, discounts or events at your favorite programs. Installing Ulti-Send is easy and once you’ve had a taste, you’ll want to tell your friends about it asap... They will remember how much easier you’ve made things for them and that means guilt free commissions in your pocket. With nearly 4 years of service thus far, Viral Mail Profits is still supported ‘round the clock, that means you can rest assured that unlike other web marketing gadgets you may have tried, Ulti-Send will continue to work for you... long after the world has forgotten what a Bieber is... with free updates for life.